1. 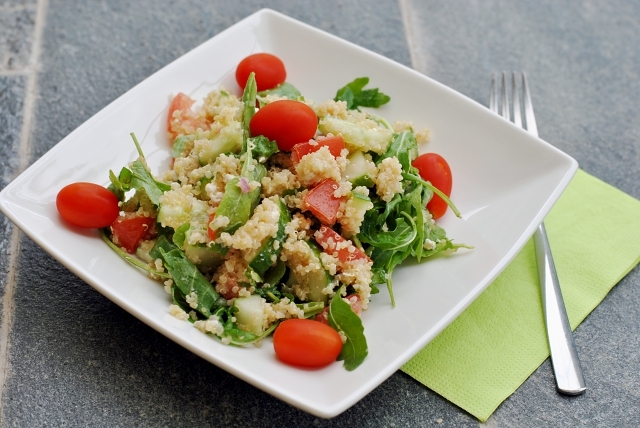 Wash the quinoa off with warm water and cook it for 20 minutes in 125ml boiling salted water. Leave the pan covered for another 5 minutes and let the quinoa cool down. 2. Cut the cucumber in little pieces and halve the cherry tomatoes. 3. Prepare a dressing in a large bowl with the oil, vinegar and spices and add the chopped scallion. 4. Put the chilled quinoa, cucumber and tomatoes inside the bowl and crumble the feta over the salad. 5. Shortly before serving the salad fold in the rocket. Yum, this salad seems extremely delicious! I have eaten quinoa but never tried to make a meal with it. Looks really tasty and healthy!